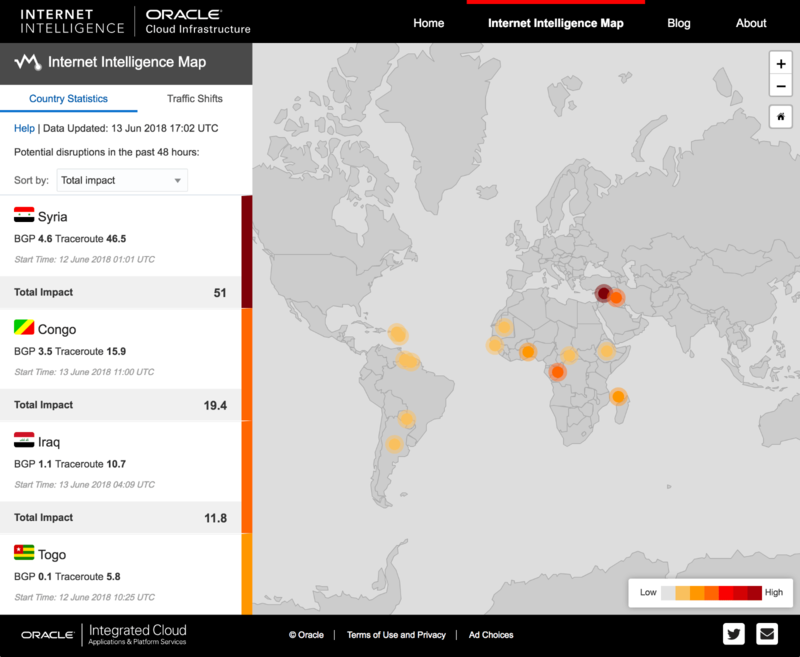 Oracle today announced the launch of the Internet Intelligence Map website; a source available for free that provides country-level connectivity statistics based on traceroutes, BGP, and DNS query volumes on a single dashboard. By presenting these three dimensions of internet connectivity side-by-side, company hopes users can investigate the impact of an issue on internet connectivity worldwide. Doug Madory, Director of Internet Analysis at Oracle Dyn, writes: "The website has two sections: Country Statistics and Traffic Shifts. The Country Statistics section reports any potential Internet disruptions seen during the previous 48 hours. Disruption severity is based on three primary measures of Internet connectivity in that country: BGP routes, traceroutes to responding hosts and DNS queries hitting our servers from that country." Local Time: Thursday, April 18, 2019 05:30 AM PDT – Page Load: 0.3537 Sec.